Digitally remastered and expanded edition of this 1984 album from the R&B vocalist. 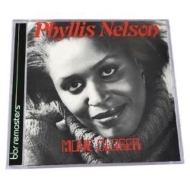 Inspired by her relationship with her husband, Nelson made a departure from her usual Dance-orientated material and penned a ballad, 'Move Closer', which became the opening track and title of her debut album on Carrere Records. Released in the UK and Europe the album provided an immediate change in fortune for the versatile vocalist. MOVE CLOSER is a Soul record of broad scope with varying styles and boasts two beautiful ballads penned by the maturing vocalist herself. Also first released as a single in 1984, the dynamic and sensitively sung opening track, describing the frustration of being apart from your lover, was championed by a London radio DJ who set the track on a slow burn up the UK singles charts. 'Move Closer' reached the summit after 11 weeks, spent 6 months on the chart and made history as the first UK #1 single to be both written and performed by a black female artist.